This low-profile pouf fits under the coffee table for easy storage when not in use. A pouf, sometimes also called a floor pillow or zafu, is a legless seat. Poufs are usually stuffed with firm filling like reedmace (cattails), buckwheat hulls or poly foam. Most are circular in shape and lack a rigid internal frame, instead relying on the filling to retain its shape. Poufs have been around for ages, but recently they’ve become quite popular. It’s no surprise; it’s hard to imagine more efficient seating. What’s more, their minimal and functional design, fits well with contemporary interior design trends and their diminutive dimensions allow it to fit anywhere. ARGH! My spine turned red! Red=BAD. Sitting on the floor can be hard on your back. While seated on a level surface, our body’s inclination is to curve our backs inwards and hunch our shoulders. This flawed posture unfortunately can cause painful stress on joints, muscles and nerves. I’m familiar with the feeling! I have young kids, so I spend a lot of time building princess castles with blocks, racing Matchbox cars, and hosting tea parties for our bear friend, Paddington. The kids, of course, prefer to pursue these activities on the cold hard floor or the coffee table! I like to participate, but sitting on the floor for more than a half hour or so makes my lower back ache. A pouf can drastically improve your seated posture by making small adjustments to the geometry of your body’s positioning. Simply elevating your hips up off the floor is a big improvement to your posture; your back, shoulders and neck are less inclined to bend forward, lessening the pressure on your discs, muscles and nerves. These seated positions encourage the best posture. 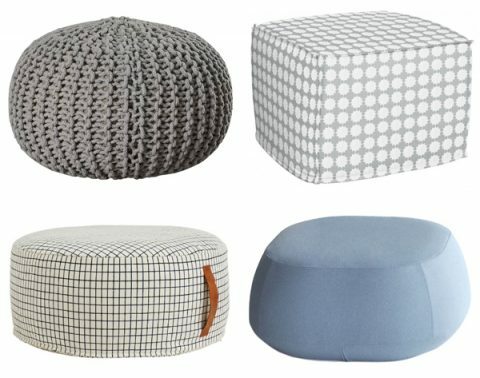 Most popular products that are marketed as a pouf are roughly the size of a small ottoman (20×15”). These thicker poufs require that you sit on them like a traditional stool or chair, with your feet flat on the floor. They will not allow you to comfortably rest your knees on the floor; they’re simply too tall. Many, however, are considerably shorter, elevating your hips only a few inches off the ground. These low-profile poufs allow you to sit in a couple of positions that encourage good posture and comfort. These are demonstrated in the photo at right: A) lower legs resting on the floor on either side and hips supported by the pouf.or B) legs crossed, knees resting on the floor and hips supported by the pouf. can be used in conjunction with a chair for leg support. depending on the filling used, they can be difficult to move around. are less comfortable than the low-profile poufs. are extremely comfortable; they enable the ideal seated posture. There’s a lot of differently sizes and shapes of poufs available. The circular and cylindrical pouf shapes are preferable for most. They are more adaptable to the shape of your body. Additionally, in the case of the low-profile poufs, they allow you to sit in position A or B shown above. The rectangular shapes might be preferable for someone looking for a pouf that might double as an ottoman or footrest. Quick and convenient seating for your home – Sometimes also called a zafu or a floor cushion, a pouf will add stylish, compact and comfortable accommodation to any room of the house. Adults can sit on them together comfortably around the coffee table with drinks while the kids use them for lounging in front of the latest movie. 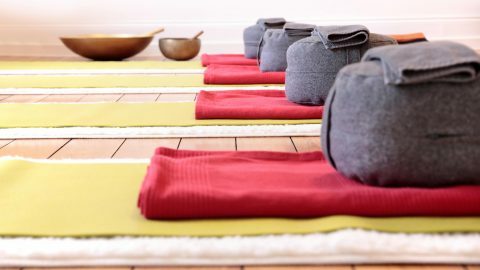 Posture Perfect – A poufs’ shape encourages excellent posture, making them ideal for use as a “zafu” during yoga and meditation. Comfort on the Go – Take your pouf with you camping, to the kids’ soccer games or to the picnic in the park. Many poufs include a durable carrying handle making them easy to take along wherever you go. What’s inside your pouf matters. Typical poufs filled with softer, compressible filling types like memory foam or down can collapse under the weight of your body. As the pouf’s filling distorts under pressure, your body’s weight shifts. This imbalance causes discomfort that is only resolved with repeated readjustment of your pouf’s filling. Maintaining a neutral and comfortable posture is difficult if your pouf is always changing shape! Completely relax with consistently comfortable and malleable support! Buckwheat hulls are a proven pillow and upholstery filling made popular with centuries of use in Asia. Thousands of tiny all-natural buckwheat hulls work together to provide support for your body that can’t be matched by traditional pillow fillings like foam or down. The unique malleable characteristics of buckwheat hulls allows them to conform perfectly to the shape of your body, providing consistent and comfortable support. Buckwheat hulls move and shift, but do not compress under pressure and lose volume or loft like traditional soft pillow fillings. A buckwheat filled pouf can be easily molded and shaped as you please thanks to the irregular edges of each individual buckwheat hull. The thousands of hulls gently grip one another, enabling your pouf to hold a shape that mimics the contour of your body, keeping you positioned consistently and comfortably. While buckwheat hulls are great for use as pouf filling, they have a disadvantage: they’re heavy. It’s not an issue for smaller poufs, but a larger one filled with buckwheat hulls could weigh as much as 15-20 lb. Is your pouf machine washable? Being that a pouf rests on the floor, it’s likely to become a little dirty with use. Some poufs come with a removable outer fabric shell that’s washable. If it’s washable, it’ll survive a wine spill. Leather poufs are more resistant to staining and, if well-made, can be a durable long-lasting choice. Give a pouf a try: cozy up with a book, get in the zone with yoga meditation, or offer extra seating at your casual cocktail party. Poufs offer a stylish and versatile seating solution for every occasion. Its minimalist design and neutral color pallet matches and enhances any decor. A traditional pouf’s circular shape and supportive buckwheat hull filling make it easy to relax while maintaining a healthy and comfortable posture. We at Hullo love poufs. We recently started selling a pouf alongside our Hullo bed pillows, calling it a “floor pillow.” Give one a try for 60 days. If you’re not sitting more comfortably, just send it back to us for a refund. 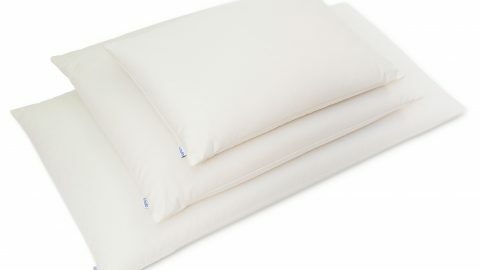 From the 100% organic cotton twill case, to the carefully sourced and selected buckwheat hulls, we cut, sew and fill our buckwheat pillows in the U.S.A. with the finest materials available.